The Millikan family is sure about one thing- they love everything about their Brangus cattle and have a passion for the lifestyle they lead. In 1981 Homer and Carolyn Millikan, currently the owners of HC Brangus in Sedgewickville, Mo., had been raising registered Angus cattle when they bought a three-quarter Brangus bull and made the decision to introduce Brangus genetics into their breeding program. Homer had been custom fitting show cattle and Carolyn was active in the show circuit when the couple, now married more than 50 years, initially met in Sedgewickville as young sixteen-year-olds. Homer admits it was his wife who convinced him to get involved in seedstock production, but it was Roy Meyer, Carolyn’s uncle, who taught him the ropes. Making a living strictly in the cattle business, Homer said you have to know what you are doing and know what you are selling. Carolyn said their steers often qualify for value added programs like Certified Angus Beef (CAB) and grade Choice on the grading scale. She compliments Brangus for being efficient, adaptable to their environment and more profitable because they weigh heavier at weaning. 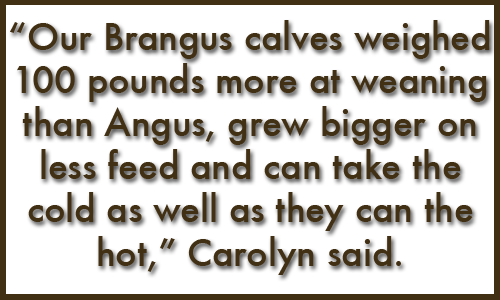 “Our Brangus calves weighted 100 pounds more at weaning than Angus, grew bigger on less feed and can take the cold as well as the hot,” Carolyn said. Aside from the Brangus breed’s advantageous qualities, Homer places emphasis on smart management techniques to make the business successful. He knows everything there is to know about his cattle. He weighs them each month after weaning, he knows what they are eating, how much feed they get and exactly how much feed cost per pound. Knowing their product and having specific goals for their breeding program is what has enabled Homer to easily market his cattle and build a positive reputation with his customers, some of which have been buying HC Brangus cattle for 15 years. The Millikans utilize some of the latest technologies to be more efficient. Homer uses Expected Progeny Differences (EPDs) to compare birth weight (BW) and ribeye area (REA) between two animals. The Millikans also utilize artificial insemination (AI) techniques to gain more access to other bloodlines, which their daughter, Bobbi Welker, oversees. Helping her mom and dad with the family business is a lifestyle Welker and her family appreciate and enjoy. She said it gives her an opportunity to teach her daughter, Samantha, important life lessons and how to be self-sufficient. Moreover, she said she could spend hours just watching the cows and calves; it is a peaceful place someone can go to get away from life’s demands and busy schedule. If you have questions about Brangus genetics or want more information, contact the International Brangus Breeders Association (IBBA) at 210-696-8231 or visit www.gobrangus.com to find a Brangus breeder near you. The International Brangus Breeders Association (IBBA) Awards Committee is taking nominations for deserving recipients of the three awards given annually by the IBBA- Breeder of the Year, Commercial Producer of the Year, and Pioneer of the Year. The Pioneer of the Year award recognizes an IBBA member, past or present, for his/her service, loyalty and recognizable contributions to the Brangus breed. Breeder of the Year recipient is a current member of the IBBA deserving of recognition for his/her successes and advancements made utilizing and promoting Brangus purebred cattle. The Commercial Producer of the Year award highlights a commercial producer’ achievements incorporating Brangus genetics into their breeding program. These awards are meant to showcase the achievements and contributions these breeders have made to the Brangus breed and the beef cattle industry. If someone you know is a deserving candidate of one of these prestigious awards, submit your nomination by Wednesday, December 31, to Robert Field, chairman of the IBBA Awards Committee, by email at calyxstar@aol.com or by phone at 662-435-4885. You may also contact an IBBA Director. Visit IBBA’s website at gobrangus.com/contact-us.php for contact information. Award recipients will be recognized at the IBBA Annual Awards Banquet in March 2015. SAN ANTONIO, TEXAS–The International Brangus Breeders Association (IBBA) hosted a kickoff gala Friday, October 3, to commemorate the establishment of the International Brangus Breeders Foundation (IBBF) and to bring education and awareness to the Foundation. Generous donors collectively gave $33,000 to establish funds for the IBBF. The IBBF will fund research initiatives to advance the livestock industry as a whole while benefitting Brangus breeders today and in the future, as well as educate the beef cattle industry about Brangus attributes and production practices. The Foundation will also provide youth opportunities to become leaders for the future of the Brangus breed and the agriculture industry. Ray Westall, owner of Brinks Brangus @ Westall Ranches, LLC, presented the IBBA with a $10,000 check to start off the fundraising. Bill and Gayle Davis, owners of Chimney Rock Cattle Co., matched Westall’s donation. Other donors included David and Nada Wood, Double W Ranch; Michael and Judy Kammerer, Red Bird Meadows Ranch; Russ and Pam Williamson, Skyhawk Brangus; Mike and Robin Vorel, Vorel Farms; and Joseph and Nancy Lingg, Lingg Brangus. The IBBA, headquartered in San Antonio, Texas, strives to provide the commercial cattle industry, domestically and internationally, with the best genetics possible. Initially founded in 1949 as the American Brangus Breeders, the purpose of the IBBA is to enable members to serve the commercial cattle industry. For more information, visit GoBrangus.com. Generous donors contributed to the funds to establish the IBBF, totaling $33,000. SAN ANTONIO, TEXAS–The International Brangus Breeders Association (IBBA) hosted its inaugural Brangus Fall Conference in San Antonio, Texas, October 2-4. Attracting more than 100 members, committee representatives, and the entire International Junior Brangus Breeders Association (IJBBA) Board of Directors, attendees enjoyed an informative conference. 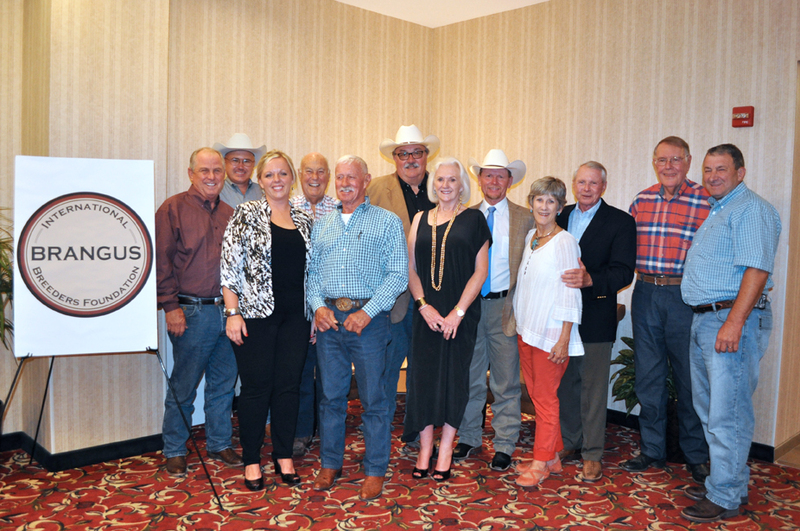 The event kicked off last Thursday afternoon with committee meetings at the Drury Inn and Suites, and a barbecue at the IBBA headquarters concluded the evening with Forrest Roberts, CEO of the National Cattlemen’s Beef Association (NCBA), headlining the event. Roberts spoke about the outstanding opportunities that lie ahead for the beef cattle industry and emphasized critical topics in need of producers’ attention like submitting comments to prevent the EPA’s definition expansion of the Waters of the U.S. (WOTUS). “The opportunities that exist for producers in the beef cattle industry are greater than the challenges,” Roberts said. Following the final committee meetings, Friday’s schedule included a field day at Doguet’s Diamond D Ranch in Poteet, Texas. A steak dinner was provided by Doguet’s, and transportation was sponsored by Charles and Charlotte Crochet from Lafayette, La. Producers were attentive during the informative live cattle demonstrations that followed about udder scoring, docility scoring, and feet and leg structure and were able to evaluate pens of cattle. Producers at the field day then directed questions to a panel of experts involved in various sectors of the cattle industry. Jason Bates, IBBA’s Director of Field Services and Commercial Marketing, moderated the panel consisting of Bill Austin, a commercial and purebred producer from Menard, Texas; Buck Thomason, a purebred producer from Cranfills Gap, Texas; Dr. Joe Paschall, Texas AgriLife Extension Agent in Corpus Christi, Texas; Jay Gray, Jr., General Manager of Graham Land and Cattle Co., Gonzales, Texas; and Lee Alford, a commercial and purebred producer from Caldwell, Texas. Friday evening concluded with the International Brangus Breeders Foundation (IBBF) Kickoff Gala. The gala commemorated the establishment of the IBBF which will fund research initiatives to advance the livestock industry as a whole while benefitting Brangus breeders today and in the future, as well as educate the beef cattle industry about Brangus attributes and production practices. The Foundation will also provide youth opportunities to become leaders for the future of the Brangus breed and the agriculture industry. Generous donors collectively gave $33,000 to establish funds for the Foundation. 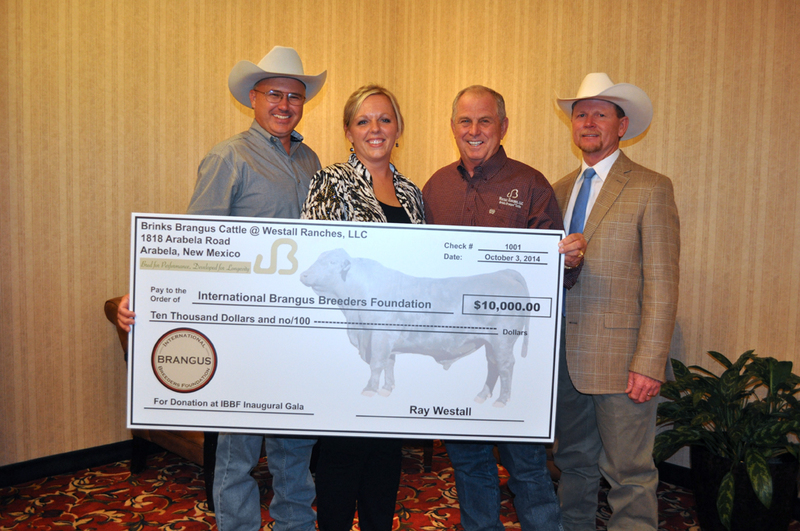 Ray Westall, owner of Brinks Brangus @ Westall Ranches, LLC, presented the IBBA with a check to start off the fundraising. Bill and Gayle Davis, owners of Chimney Rock Cattle Co., matched Westall’s donation. Other donors included David and Nada Wood, Double W Ranch; Michael and Judy Kammerer, Red Bird Meadows Ranch; Russ and Pam Williamson, Skyhawk Brangus; Mike and Robin Vorel, Vorel Farms; and Joseph and Nancy Lingg, Lingg Brangus. A Board of Directors meeting Saturday morning wrapped up the inaugural Brangus Fall Conference. Video highlights and coverage will be available at GoBrangus.com. The IBBA, headquartered in San Antonio, Texas, strives to provide the commercial cattle industry, domestically and internationally, with the best genetics possible. It was founded as the American Brangus Breeders in 1949 and has since evolved into the IBBA. The purpose of the IBBA is to enable members to serve the commercial cattle industry. For more information, visit GoBrangus.com. In an effort to give more members a voice in the evaluation of IBBA national and regional shows as well as IBBA approved judges, the IBBA has created an IBBA show survey. The survey, available for download and online at gobrangus.com/member, allows exhibitors and spectators to give their opinions on any recent IBBA national or regional Brangus show. The survey should be submitted within 30 days of the show in order for the show committee to accurately take all opinions into consideration. All completed surveys should be returned to IBBA Director of Shows Tyler Dean at the information listed at the bottom of the survey. Questions should also be directed to Tyler at (405) 867-1421 or by email. Click on the image to open the survey, and download it to your computer. Once the survey is completed, follow the submit instructions.